A circus without elephants could be in the near future for Ringling Bros. and Barnum & Bailey Circus if the plaintiffs, including ASPCA and the Animal Welfare Institute, succeed in their lawsuit that heads to trial this Wednesday. The lawsuit, which will be in the U.S. District Court in Washington, D.C., aims to stop the prolonged use of chains and bullhooks in elephant training. According to the David Crary’s article, “the plaintiffs hope the lawsuit pressures Ringling Bros. to stop using elephants in its shows”. The circus was never a big event for me as a child, I can only recall going once, but for some families it is a very popular attraction and even a tradition. Ringling Bros. argues that their audience surveys have shown elephants to be the “favorite attraction”. But at what cost? The bullhook, or ankus, is a hook attached to a two or three foot handle. The bullhook is applied at sensitive points around the elephant’s body to cause it to recoil from the source of pain. Trainers employ this method of avoidance learning, in which a behavior results in the cessation of an unpleasant stimulus, to train the elephants. The problem is despite the fact that elephants appear to have tough skin, they actually have very sensitive skin. They take mud baths in the wild not only to protect their skin from sun exposure but as a coating that prevents damage due to loss of moisture, insect bites, and other environmental factors. Therefore, I personally feel that it is only reasonable to find this method of training inhumane. In addition to the alarming use of bullhooks, the plaintiffs have shown, using Ringling Bros. train records, that elephants have been restrained by chains in railroad boxcars for an average of 26 hours at a time, sometimes as long as 60 to 70 hours while in transit. At night the elephants are also chained to prevent “them from foraging off their companions’ food”. While this is technically legal under current government regulations and for travel purposes is due to safety measures, is it fair to require these animals to remain sedentary for such long periods of time? In some Asian cultures, the elephant’s memory and intelligence has been considered to be on par with hominids, which includes us, and cetaceans, which includes whales, porpoises, and dolphins. They are the largest land animal and have no natural predators. Yet the population of Asian elephants, which are traditionally used in circuses, is currently estimated to be 60,000, which is almost one-tenth of the current African elephant population. Maltreatment by humans in captivity and hunting of wild elephants poses a great threat to these magnificent creatures. Furthermore, it has been shown that elephants in captivity often have shorter lifespans than their wild counterparts. So, before you decide to take your kids the next time the circus is in town, realize that your money has the power to tell companies, like Ringling Bros. and Barnum & Bailey, how you feel about the treatment of their animals. Human tricks at Cirque de Soleil is about as close as I’ll get to a circus performance until policy for animals changes. 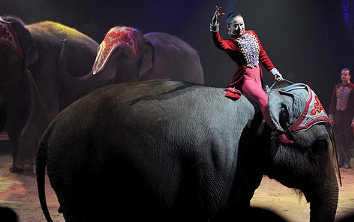 Circus animals, including elephants for the most part revieve very good care. I’m the guy who will stop my car on the side of road to lift a turtle out of harms way, then continue on to the circus to enjoy the performing elephants, ignoring the “animal rights” protesters outside. I then go home and take car of my cat that I rescued from the local animal shelter. If these animal rights do-gooders want to really see some animal abuse, tell them to look in their own local communities. Dogs left out all night chained in sub freezing weather, stray cats living in dumpsters, horses out in the hot sun with no shade or fresh drinking water, abandoned pets injured or killed on the roads…I don’t see these conditions at the circus! For animals, the circus enviorment provides far better than avarage living conditions and care as compared to what many thousands of other animals have to live with. There are more urgent animal welfare issues that could be dealt with in the Courts than circus elephants! Oh, I hope they succeed in eliminating elephants from the circus. I used to love the circus as a kid, before I understood the abuse those animals faced day in and day out. I will never take my kids to the circus as long as elephants are a part of it. Thank you so much for this article. I have never been to a circus and will never if they continue to use animals like elephants. I have seen some of the training videos and it is shocking what they do to these beautiful creatures. When my nieces and nephew have asked about going to a circus I have told them I will not take them and I explain to them why. If we tell our kids (and parents) the truth about circus animals then the demand for this type of “entertainment” will decrease and perhaps companies like Ringling Bros. will rethink their use of animals. I would actually be happy if circuses did not exist at all. There are definitly other forms of animal abuse out there other than the circus, but the circus is definitly one of the worst! Just because elephants are not a cute kitten or a sad dog, doesn’t mean that they don’t deserve good treatment as well. I have recently written my thesis on animals in the circus industry (including elephants) and have learned some very disturbing facts about what actually happens behind the scenes, along with seeing some video footage. Just because you don’t see it, doesn’t mean it does not happen. I am not a crazy animal rights activist who protests and throws red paint on people, but I do care about their well being. I will not go to another circus where animals are being used unless they change this. I go back and forth on the issues of circuses and zoos. I went to the circus recently fully expecting to walk out saying “the circus does not need elephants and tigers.” But… there is magic there for children. They were awed. How can kids form an emotional bond with these animals and want to help them, preserve their habitat, if they never experience them? (Not everyone is capable of taking an eco-pilgrimage, let’s get that out of the way now.) Perhaps it would be better to focus on making the animals’ experience as humane as possible.